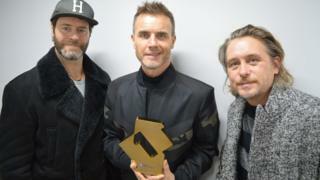 Odyssey, Take That's re-imagined greatest hits album, has topped the UK album chart and is the fastest-selling album of 2018 so far. The band, who are celebrating their 30th anniversary, sold a combined 106,000 copies of the record, with 94% in a physical format. They even sold nearly 900 cassette copies of the album, which is their eighth chart-topper. Sir Cliff Richard landed his 45th Top 10 album with his latest, Rise Up. Roy Orbison's second posthumous album with the Royal Philharmonic Orchestra went to number eight, while classical singer Alfie Boe's As Time Goes By entered the chart at 10. Despite a big promotional push, Phoenix - the long-awaited second album by Rita Ora - missed out on the Top 10, earning a spot in 11th place. Take That's Odyssey features songs "re-imagined with new arrangements and production" by producer Stuart Price. It includes three new tracks - Out of Our Heads, Spin, and Everlasting. In the singles chart, Ariana Grande has held on the top spot for a fourth week with thank u, next. The highest new entry is London rapper Digdat, whose remix of his track Airforce, featuring Krept & Konan and K-Trap, just scrapes into the top 20.